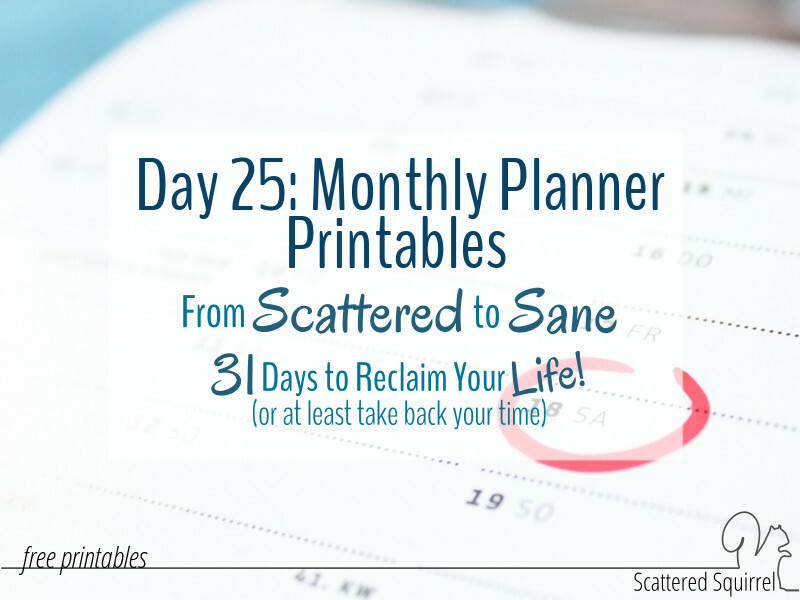 Creating habits and planning for the future are the two biggest components to taking yourself from scattered to sane. I can’t stress enough how important it is to build those daily routines and work on making your three daily items a habit. It’s equally important to take the time to look to the future and formulate a plan for how for how to get where you want to go. Now, I don’t mean sit down and create 5, 10, and 20 years plans because right now it’s more important that we look to the near future. Trying to look too far ahead when we’re feeling scattered will often only add to our feeling of overwhelm. Instead, we need to look to the near future. We started with looking at just our daily tasks; looking one day at a time into the future. Then we added in our weekly stuff and now we’re ready to start looking a little farther into the future. 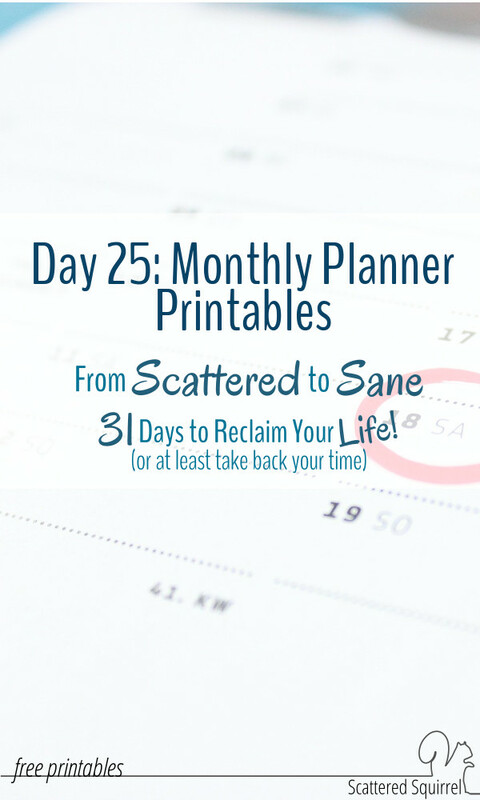 That’s where the monthly planner printables will come in handy. One of the biggest problems we face when we’re feeling scattered is how to find that calm space. Little step by little step we’re slowly starting to take back our time and reclaim our lives from the chaos. Each of the steps we’ve taken has been its own sort of plan. Each and every step, in its own way, has been a plan. Why is planning so important? Planning takes the guess-work out of what we’re going to do and when we’re going to do it. When we’re buried under mile long lists of things we need to do or twist-turned around trying to find the time for everything and anything we think needs our attention, a plan will show us the way out. I know it can be hard to see the reason for planning. It is just one more thing we’re adding to our to do list. But it’s the one thing that can help us tackle that list and take back our time so we’re not always feeling behind or like we’ve lost a whole day and don’t know what we did with those hours. A plan sets boundaries and parameters for how we’re going to spend out time and, essentially, gives us permission to not get everything done. We craft a plan for our time using our priorities and work through that plan, and then we’re done! Oh, we can totally give ourselves bonus points for doing extra, but if we choose to stop when our plans our done that’s great too, because we completed what we set out to do. To make our plans effective they have to have limits. Just like I said to limit your daily and weekly focus to just three things to start with so we could build those foundation routines well, our plans need limits. That’s where the monthly planner printables are going to really help. These monthly planners are not a calendar. 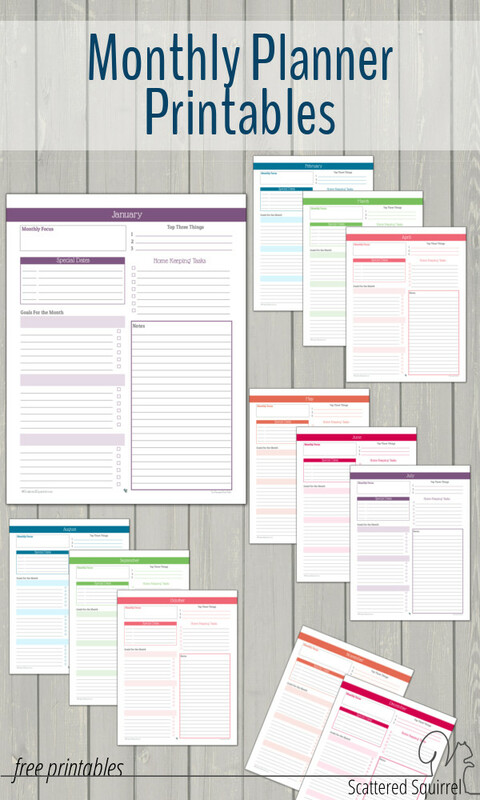 I really wanted to design something that would be a useful tool for you when it comes to planning your time. Even if you haven’t been following along with this series, these planners will still go a long way to help you take back or keep control of your time. Each section was chosen carefully to make sure that we’re not tempted to over extend ourselves in our planning. Each month I like to choose an area I want or need to focus on. This allows me to sort of keep that in mind when I’m scheduling things and making plans for the month. During my weekly planning sessions I try to make sure I’m measuring new tasks against that focus, that way I can make sure I’m making time for it. For example, November is deep cleaning month for me. I like to give the house a good deep cleaning before the holidays, so when I’m planning my month I’ll make sure to make time for the extra cleaning. You’re probably getting tired of seeing the number three, but I apply that rule to all aspects of my planning. In this case, I just pick the three things that are the most important things that I need to get done that month. If I get nothing else done, those things MUST be done. They could be as simple as unhooking and putting away the hose and shutting off the outdoor water taps before winter. Or something as complex as doing the taxes. These three items get scheduled onto my monthly calendar for that month so I don’t forget them. From birthdays to special school days, there is always some date I need to remember each month and this is the spot where I jot them all down. The home keeping tasks part is where I jot down anything that needs to be done around the home or yard. I check my Indoor and Outdoor Maintenance lists and add anything that needs to be dealt with to this section. This way I remember to make time for them throughout the month. I am a big believer is setting goals. Goals are dreams mapped out into life. Whether I’m working on a big goal or a small goal, there is always something I work towards each month. Sometimes I use this for helping me stick to my focus or complete one of my top three things or to help me tackle something I really don’t want to do. I made sure I left room to write not just the goal, but the steps needed to complete that goal. Breaking a goal down into smaller steps is a great way to help yourself accomplish your goals. Finally, I included a notes section. 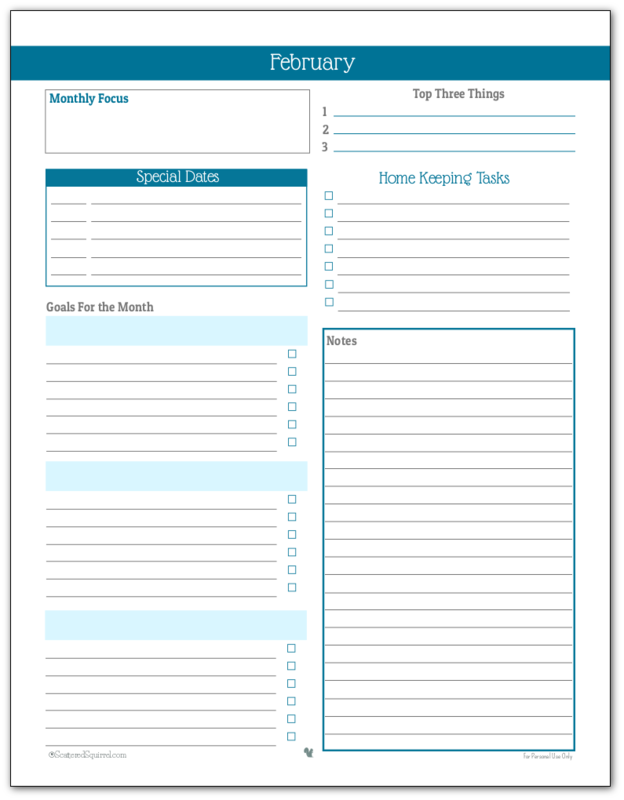 This could be used for reminders, extra things that need to be done, or just or jotting random things. Whatever you need it for. They’re really quite simple, but they allow us to structure our to dos so that we’re focusing on what needs to be done that month. Which allows us some freedom when it comes to clearing out the scatteredness. We have a focus and a purpose and a limit to what we expect of ourselves. As always, to get a copy of the printables for yourself just click the pics of the ones you want. Want them all? Not a problem, I’ve bundle them all together in one file to make it easier for you. Just click the pic below to get that one. If you take a little time to give yourself boundaries and use your priorities as a guide for how you plan your time, you will find that after a little while you stop feeling scattered and feel more in control. It sounds kind of hokey, I know, but it’s true. Take it from someone who used to think planners were a waste of money and not really all that effective – how you use your planner is just as important as using it in the first place. You deserve to take back your time and reclaim your life. Let the tools work for you, and see what happens. Today’s homework, should you choose to accept it is to spend a little time thinking about how you plan your days, weeks, and months. Do you try to fit everything in until you’re running ragged and can’t find a spare minute to breathe let alone relax? Or do you use your planner/planning system to give you limits to work within? You always make really good planners. Thank you. On your Monthly Planner Printables individual pages you have April page instead of December page. Can you fix that? These are wonderful!! Thank you for your creativity, ideas, and guidance. Even in retirement, planning and setting goals are essential. These forms will be a tremendous help. I’m so happy to hear that you like them Deanna and think they will be helpful for you. I love all of your designs, coordination, and information on all of your sheets. I especially love the kid school information one. I was able to use these to make a really nice Christmas gift for both of my bosses. I was wondering if you would happen to have a activity tracker for like sports, practices, games etc or what you would recommend. Again these all look amazing!! Oh I’m so happy you like the printables Emily. I currently don’t have a sports/activity tracker, the closets I have is healthy habits tracker that included a spot to jot down your daily exercise and keep a food journal. I’ll add it my list of printables to make though. 🙂 I probably won’t have it ready until the new year. Thanks so much for taking the time to reply- I just got this notification. If it helps at all the sport and practice thing would be for travel teams which are mostly year round, especially with tournaments. Thanks again! I refer you to a lot of my college friends! Thank you so much for sharing these! They are perfect for planning. Would you mind sharing what font you used for the Month and “homekeeping tasks”? You are very welcome Erica. I’m thrilled to hear that you like them. As for the font, it’s called Glass Antiqua and I found it on Google Fonts. It’s a quirky little font isn’t it? These are amazing. I love them. I will be using them to keep organized at home and at work! These are so great as always Alli! The page may not be loading correctly for me, but I don’t see September or October in the list. Thank you so much for all you do!!! Yikes! I thought I had fixed these already. I’m going to get this sorted out right now. We migrated to a new server a few months ago and some of the pictures didn’t come with us. Thank you so much for letting me know about this. Sorry but I still don’t see a monthly link for October. Everything else is there, just not that one. Love this series. Thank you so much!!! Hi Sharon, that is so weird. I know it was there. I am so sorry for the mix up. It’s there now. I’ve triple checked. Hi Kimberly, both of those should be appearing now. When we moved to a new server some of the photos didn’t come in the back up. I’ve been working at replacing them as fast as I can. Will there be monthly planning pages to match 2019 or am I just not finding them? in the 2019 colors? Thanks! Hi Shirley, yes I am offering monthly planners in the 2019 colours. They’re in the post titled Setting Up Your 2019 Planner. I love your site. I appreciate that you took the time to make the week on 2 page printable for personal size planners on letter size paper, as I can no longer print on personal size paper; and that it starts on Monday. I’d like to know how I can get a personal size monthly printables where the 2 pages are side by side (Mo2p pages on one letter size paper and Mo1p: 2 on 1 letter size paper). Not sure if I explained it correctly. Thank you so much for your kind words, Alicia. I’m so happy to hear that you like the site. I think I know what you mean, you’d like to be able to print a two-page monthly calendar on letter size piece of paper. Right now I don’t currently offer those. However, Wendaful design has some very pretty monthly calendars and other free printable inserts on her site. Just hover your mouse over the Free Printables tab and select Printable Inserts from the drop-down menu. She has a ton to choose from and they come in personal size. I hope that helps. I’ll try adding some more personal size planner pages to my list of printables to make. I’m sorry I couldn’t be more help for you.